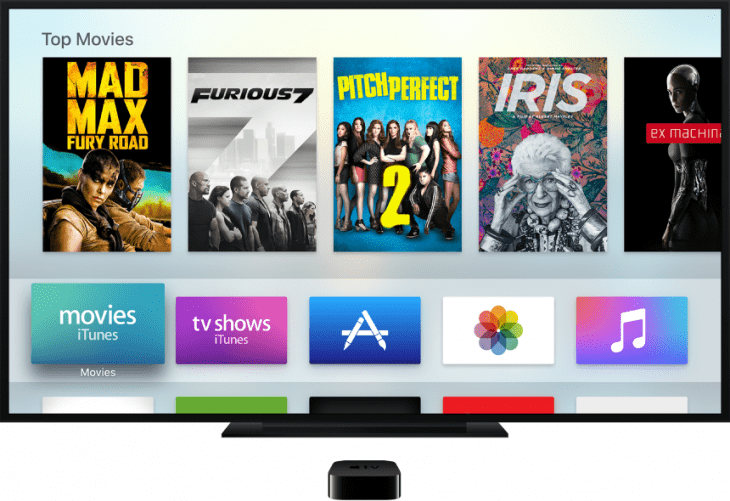 The fourth-generation of Apple TV has finally arrived and users are clamoring to try all the features that Apple has been talking about over the past couple of months. Whether you are a new Apple TV owner, a loyal fan who just upgraded or someone who is still trying on the verge of buying Apple’s box, we’ve got you covered. Those of you who have pre-ordered the device should have received it already while the rest of you can grab one from both the online and real-life Apple Stores. Apple says that its box represents “The future of television” but the tagline does little to explain what an Apple TV can actually do. I am not going to delve into specific details about the world of streaming boxes here but I can tell you what to expect from your own device. First, the new Apple TV places a huge emphasis on apps and games. Given Apple’s track record of enticing developers to join its platforms, I am sure that we will see plenty of video games and all kinds of different apps in the near future. On top of that, Apple wanted to offer an entirely new TV experience to its users, at least to those who have never used a smart TV or a similar device before. The UI has been overhauled to make everything easy to find and the Siri Remote’s sole purpose is to provide as many options as possible when it comes to interacting with the TV. 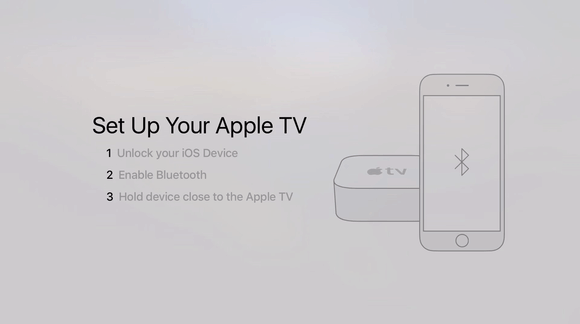 Users can navigate the TV with the remote and its Touch trackpad or speak their commands with the Siri integration. Finally, all Apple TV content is tied to the company’s other services so users of Apple’s services are the ones who will benefit the most from this device. Apple TV currently has two distinctly different set up methods. The first one requires an iOS 9.1 device while the second one has no requirements. The difference between the two methods is tiny but using an iOS 9.1 device is a bit faster as it allows you to set up a few things automatically. Of course, we will show you both methods so you can decide which one you like the most. Turn the TV on and grab the Siri Remote as you will need it to set up the box. In case you are unfamiliar with how it works, you can use the trackpad at the top to move around and click on it to select/activate stuff. 1. Apple TV should automatically choose the correct language for your area but if you would like a different one, you can do it right now. 2. Same as before, choose your desired region or leave the default setting on. 4. A prompt will appear on your iOS device so tap on “Continue”. You may also need to agree with certain terms and conditions so keep that in mind. 5. If everything goes well, Apple TV should scan for the Wi-Fi network you are currently connected in and will then use the credentials from your iOS device to log in. Should that fail, try to reconnect your device by resetting the connectivity. 6. At this point, the media box will ask for your Apple ID and your password so that it can get synced with everything. 7. The next steps all revolve around optional items and services which you can choose to enable or disable at any point. Those include Location Services, Siri and Apple’s HD wallpapers. The last item on the list is perhaps the most important one as Apple will ask you whether or not you would like to send anonymous statistics to the company and to third-party app developers. Make sure that you read through everything as Apple provides adequate explanations for each piece. For instance, the HD wallpapers are brilliant but they do take up quite a lot of space which you may want to reserve for something else. 1. Go through the same route as before but when you get to the set up selection menu, choose “Set Up Manually” option instead. 2. Apple TV will not automatically scan for your Wi-Fi network so you will need to select it from the presented list instead. You will need to enter your password too so make sure you remember it. 3. Apple’s box will take some time to activate, after which you will need to enter your Apple ID. The best option is to use the same one across all Apple services but the choice is up to you. The set up process will require your password at this point so enter it to continue. 4. The rest of the process is exactly like what I described before. You will need to agree to terms and conditions and then choose which services you would like to participate in. Once you have agreed to the last part of the Terms and Conditions, your Apple TV will be ready. Now that you have your Apple TV all set up, it is time to go exploring. You literally have a box with hundreds of apps and games waiting for you and Apple TV 4 may be entirely different from what you have been used to thus far. Download a few free items and make sure to test your Siri Remote as a gaming controller. Keep an eye out for more Apple TV guides too as we get more familiar with it and if you have any questions, make sure to drop a comment down below or visit the forum for more in-depth discussions.